What happens to items that are donated to the History Center? Will I ever see them again? Yes! That’s what we do! As the first point of contact for potential object donors, it is still surprising how often I get these questions. They speak to a disconnect between what people think we (i.e. museums) do with objects and what we actually do. If for some reason you’re afraid we take things to hide them away and never share them, then it’s time to set the record straight! This means that, even though an object becomes the property of the museum when it is accepted into the collection, it is still held in the public trust where it will be protected and preserved but also shared and enjoyed. It is true that most of our collection is in storage, but that is not unlike the majority of museums – there will always be more items than there is gallery space to exhibit them. But that doesn’t mean they are out-of-sight, out-of-mind. Our Collections Department is devoted to the care and management of these objects and their preservation for future generations. We advocate for what’s best for the objects and their long-term care while balancing the desire to exhibit and share these important resources. 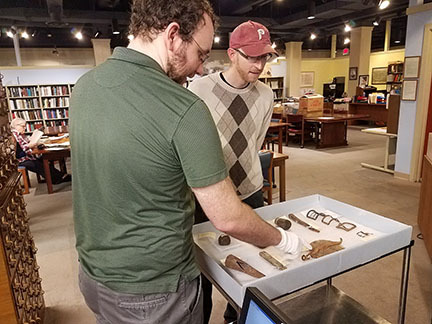 A few weeks ago, we received a call from a gentleman who was interested in research and any objects we might have from the Old York Valley Inn. His ancestors built the original structure in the 1700s, and he was hoping to learn more about the site and if there were any related objects in the collection. We took his contact information, and after doing a little research, we were able to set up an appointment for him to see some artifacts that were recovered from the site when the building was demolished in 1962. The pieces we were able to pull from storage included shoe buckles, a wooden crock cover, metal tool fragments, and even a small cannon ball. He was delighted to connect with his family’s history and we were delighted to help him do so! “Public Trust and Accountability Standards.” American Alliance of Museums, 1 Feb. 2018, www.aam-us.org/programs/ethics-standards-and-professional-practices/public-trust-and-accountability-standards/.